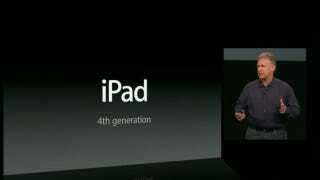 Sure, today's mostly about the iPad Mini, but Apple just announced a new fourth generation full sized iPad. It's a lot the same, but some key things have changed. Here's everything you'll want to know about it. The tablet has a new A6X chip, which Apple claims runs twice as fas on both CPU and GPU functions. That's pretty standard by now for Apple, which sees performance gains in that range every generation, but it's just six months after the last go-round, so it's sort of impressive. Sorry, everyone who bought an iPad in the past few months. The screen is the same 9.7-inch 264PPI display. The new iPad also has a Lightning connector, replacing the old 30-pin connector, which presumably saves some size in the body, but there are no dimension changes to report. Fingers crossed that that means Apple just went ahead and crammed some extra battery into it. It fits into the regular iPad pricing scheme, starting at $500, and an LTE model costing $630. The quick release makes sense for a few reasons. It never made sense that Apple's most giftable gadget (no contact like the iPhone) was getting creaky around the edges by the time the holidays rolled around. A semi-update makes sense in that respect. (Though hopefully it doesn't mean the start of an S cycle on iPads.) It also makes sense to have an iPad out with a Lightning connector, for holiday accessory shopping. It's possible that the quick turnaround on the A6 chip was made possible by the chip being the first Apple designed on its own (using ARM reference designs) as its own custom core. That gives Apple more control over the chip on a lot of levels, including performance and power consumption. We'll see if that alleviates any of the hot iPad problems. Overall, the update to the iPad is a decent one. You definitely won't be bothered to upgrade if you've got an iPad that's just a few months old, and the size and weight gains are still there over the iPad 2. So if you weren't moved to buy last generation, chances are this one isn't that big of a deal to you. But at least you can rest easy that there will be a while until the next update. Probably.